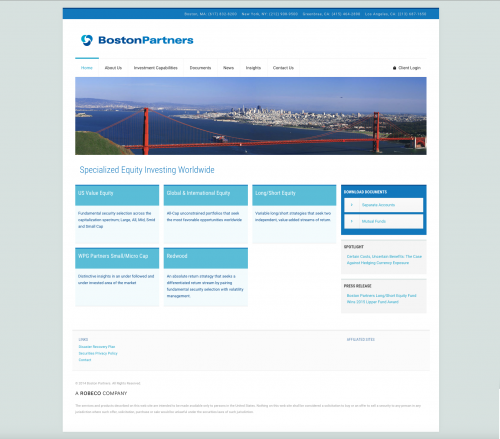 Boston Partners is an investment organization with $78 billion of assets under management. The design of their old website had become dated and it was somewhat confusing to navigate. The client wanted to upgrade the look and feel; they also needed to add key product information frequently sought by clients and staff. First steps (as always) were to identify the audience for the site, their devices, and use scenarios. What information did they need to access and how could we get it to them faster and more easily? This step took some time to work through as the firm has a wide variety of investment capabilities and publishes many different kinds of documents for each product. The client provided excellent guidance on what was needed and together we worked out a solution. 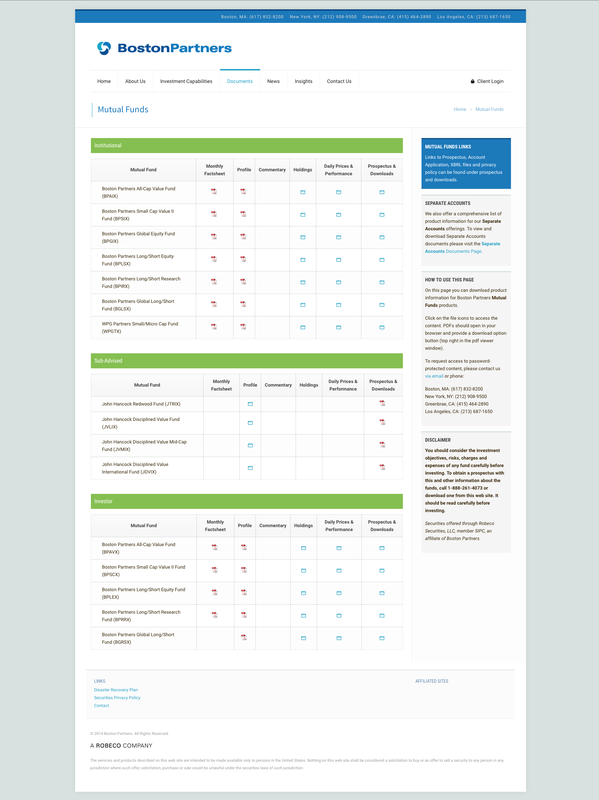 For product literature we finalized two pages, one for Mutual Funds and one for Separate Accounts which would provide all the relevant documents in an easy-to-understand layout (which resizes automatically for different sized devices). The document files are regularly updated so I built a custom section on the backend where the client could add/edit/delete products and easily upload or remove files for each one. Requiring only one page visit in the back end this is much easier and more accurate than uploading files to the media library and copying each url over into a post. We also separated the core product offerings out in the "Investment Capabilities" section, providing each one with a landing page containing information on the investment approach, products, assets under management, team members and experience. As well as product information, Boston Partners regularly publishes white papers, press releases, commentaries, Q&As and is often featured in the press. We organized these items into two sections, "News" and "Insights" and set up a taxonomy system where the client-side publisher can check a box from the predefined categories and have the post appear in the correct section automatically. 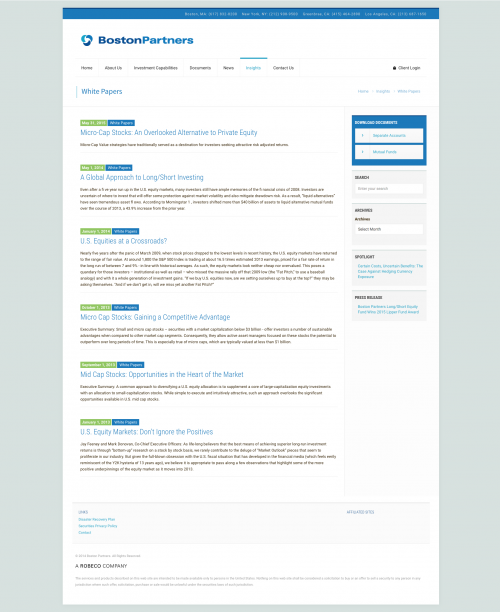 Similarly, visitors to the site can easy navigate to all posts in a specific category. We migrated the site from my server to their in-house dev server and tested it thoroughly before pushing it live on their production server. The IT team at Boston Partners manages the site and all updates in-house and I check-in quarterly to answer any questions and address feature requests.